My brother, Tom and I grew up with rock and roll. To this date, I still remember lining up in the freezing morning with Tom waiting to buy the Beatles movie tickets. 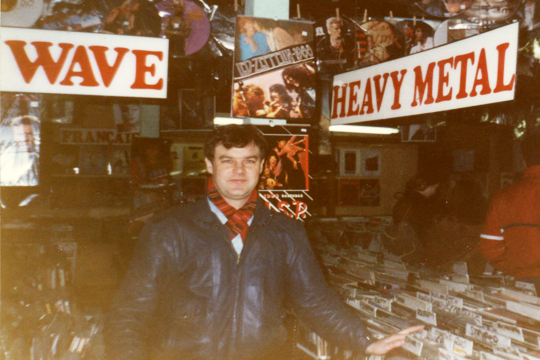 When we first opened our record store thirty-five years ago, the goal was simple: to share the music we love with our generation while at the same time make a living. We bought a Chevy van (blue!) and went door to door asking people to sell us their used records. The demand for used vinyl was growing quickly and very soon, our store was packed with records. I was in charge of the marketing so I put up a few runners together with nails to display albums and records in the store. This improved our sales drastically. It was a very simple installation, and I knew that the design concept could be helpful to a lot of record fans to show off their collections. For over 35 years, not only did Tom and I witness the ups and downs of vinyl records and the evolution of music digitalization, we figured out the concept of RecordWall-it. When I decided to develop my idea of an easy access record album frame, I looked into expanding its functions and versatility that will meet the needs of record collectors and yet be affordable to every vinyl fan! Launching this simple idea has become an American dream. And I dedicate my dream to you – my customers.